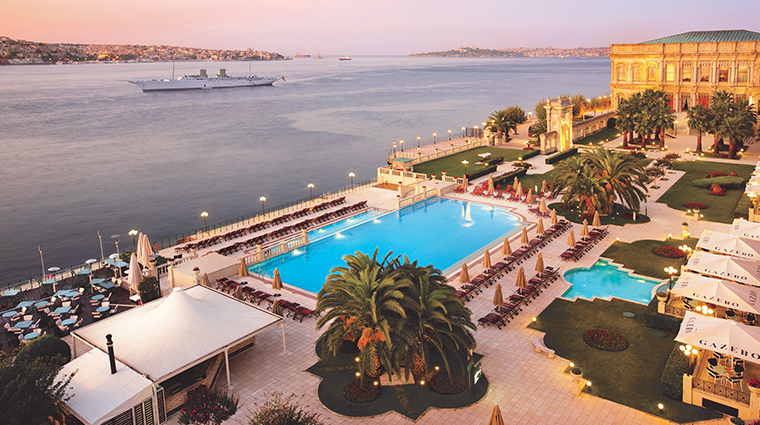 With a spectacular waterfront locale, a vast garden and a heated outdoor infinity pool that looks out over the Bosphorus, The Sanitas Spa & Wellness provides aserene hideaway within the bustling historic city of Istanbul. Playing on its unique location straddling the boundary between Europe and Asia, the spa keeps a plethora of treatment options — from Turkish bath rituals to Ayurvedic healing massages. But the ultimate in luxury can be found in the gold-inspired offerings, designed to remind you of the building’s glittering origins as a 19th-century Ottoman palace as you get pampered from head to toe. The three-treatment-room facilityis cozy, but it ensures you’ll be pampered by the staff’s gentle hospitality. You might even feel like you have the spa to yourself. 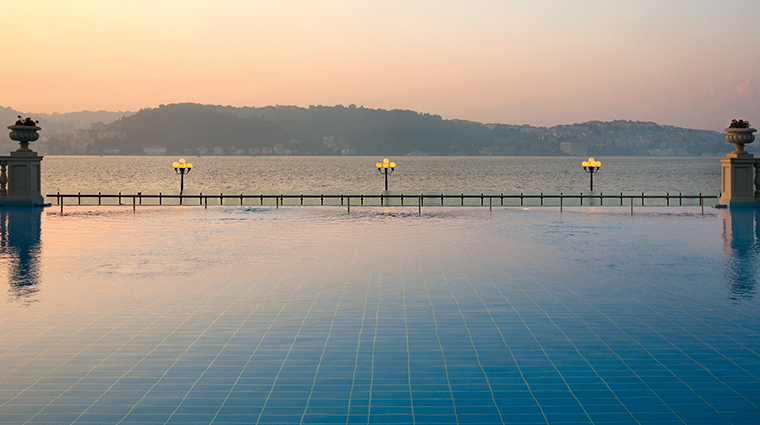 The outdoor infinity pool is the star of the hotel and spa. Save time to lounge in the alfresco oasis with a gentle slope sprawling out to the garden area. Changing rooms are comfortable with plenty of amenities like body cream, shaving kits and soaps on offer. Note that there is a super-quick bathing suit dryer and bags available, should you need to store your suit after a dip. You can’t visit a Turkish spa without trying a hammam, and this sensational spot offers several options. The most indulgent offering is the VIP Treatment, an 80-minute cinnamon-honey body mask complete with essential oil scalp, hand and foot massages. The range of services offered is impressive, truly fit for Istanbul’s position as a bridge between continents. Take your pick of Asian classics (shiatsu) combined with Turkish traditions (hammam) and Western treatments (collagen facials and coffee scrubs). The outdoor infinity pool is heated during colder months. Even if the weather is not promising, it’s worth taking a dip. 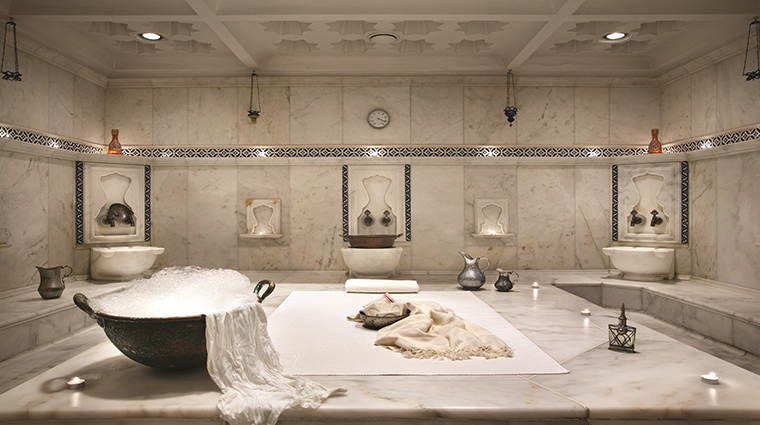 The Turkish hammam detoxes the body through sweating, so be sure to drink lots of water to keep hydrated. Luckily, there is no shortage of ways to quench your thirst in the luxury spa — cold and room-temperature bottles, acidulated water with lemon and green apple, and green and herbal teas can be found around every turn. If you have your heart set on a hammam service, reserve your spot as far in advance as possible — it’s a private space and there is only one. However, couples and families can be accommodated to use the hammam facilities together. The Istanbul spa offers Asian therapies like Abhyanga, where hot Ayurvedic oil is poured slowly over your body, followed by a massage to boost blood circulation and energy flow, and remove toxins. Asian Spell delivers a Balinese deep-tissue massage that homes in on your pressure points. The service will relieve muscle tension and balance your energies. Get a tailored-for-you facial with the Selvert Classic Face Treatment. After a test, your dermis will get a deep cleansing and peel. The moisturizing service is good for all skin types. The hammam experience is the thing to do when in Istanbul. For the uninitiated, the Shehrazad treatment is a cross between a massage, a body scrub and relaxed bathing. A stay in an actual palace might inspire you to immerse yourself in gold. The Caprice Gold Massage envelops you with sweet almond oil, palm oil and 24-karat gold particles; the Selvert Gold Face Treatment tightens the skin giving a magical gleaming and glittering effect; and the Selvert Gold Body Care offers the same shimmering touch for the whole body. The relaxation area is fairly cozy, but during the summer, the gardens and outdoor poolside area make for a scenic spot to chill out pre- or post-treatment. A whirlpool allows a comfortable spot to unwind after a workout in the compact gym. The changing rooms come with a small steam room and sauna for some additional relaxation. Get your hair done or have manicures and pedicures at the onsite salon.